Death Angel is an American Thrash Metal band, and has come to be known as one of the most influential bands to emerge from the thriving Bay Area Thrash Metal Scene in the early 1980s, an era when one could catch Cliff Burton (Metallica) at the front of the stage at Ruthie's Inn banging his head to Death Angel's inventive style, and speedy, complex arrangements. 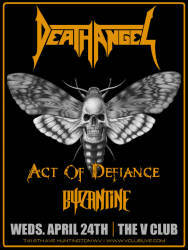 In 1986, a Death Angel demo produced by Kirk Hammett (Metallica) titled "Kill As One" sparked the interest of Enigma Records. Then, in 1987, Death Angel's debut, "The Ultra Violence", was released. Drummer Andy Galeon was just 14 years old at the time. The album was a full-frontal assault on the ears, buzzing with the group's youthful energy, and "The Ultra Violence" sold 40,000 copies in just four months. 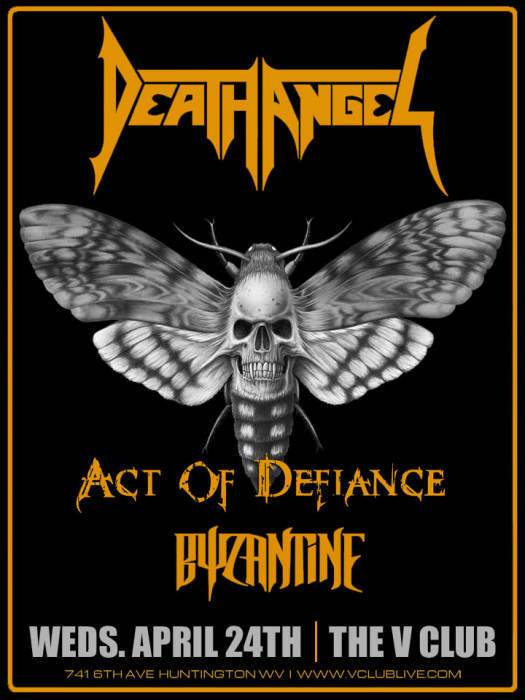 Act of Defiance is an American extreme metal supergroup from Los Angeles, California, formed in 2014 by guitarist Chris Broderick and drummer Shawn Drover of Megadeth after they both resigned from the band on the same day, with vocalist Henry Derek (ex-Scar the Martyr and Thrown Into Exile) and bassist Matt Bachand (Shadows Fall).